For many, 3D printers seem like a fun tool to print plastic trinkets. But thanks to the unique properties of embryonic stem cells, the machines may one day be used by doctors to print micro-organs to save the lives of transplant patients. Embryonic stem cellls come from human embryos, and have the unique ability to develop into any type of cell the body needs, including brain tissue, organ cells, or bones. That’s why they have long been a research focus for regenerative medicine aimed at repairing damaged tissues and organs in the human body. The most common way to experiement with the cells is called differentiation, which involves dosing them with biological cues that encourage them to develop into certain types of tissues. In the beginning, the cells create spherical masses (termed embryoid bodies), similar in nature to the process of early embryo development. Researchers have realized that a 3D environment, as opposed to a petri dish, is a much more suitable way to grow embryonic stem cells. The 3D environment creates the closest facsimile of natural cell development in the human body. The first 3D printer designed for embryonic stem cells was developed by Organovo, and used to successfully print cells by researchers at Heriot-Watt University in Edinburgh. The printer works in a strikingly similar way to regular printers, by laying down layers of material. The only difference is that the 3D printer can lay layers on top of each other to create objects. 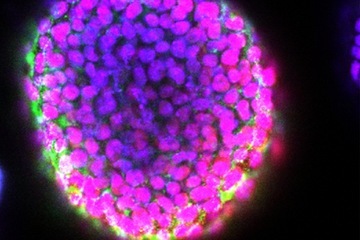 Up until this point, the 3D printers for embryonic stem cells were only able to create simple arrays or mounds of cells. But that’s all changed, as now researchers can create embryoid bodies with more structure and control. Wei Sun, a co-author on the study and professor of mechanical engineering at Tsinghua University in Beijing and Drexel University in Philadelphia, told Live Science, "We are able to apply a 3D-printing method to grow embryoid bodies in a controlled manner to produce highly uniform blocks of embryonic stem cells." That’s the extent of the research so far, but the advancement makes building complex tissues possible, including micro-organs. The study offered promising results, with 90% of the cells surviving the process of printing. After printing, the cells developed into embryoid bodies and began generating healthy proteins. The cells were cultured in a hydrogel scaffold, which could be dissolved to harvest the embryoid bodies if needed. The researchers expect that their method allows for the most control over embryoid size and structure. Sun said, "The grown embryoid body is uniform and homogenous, and serves as [a] much better starting point for further tissue growth. It was really exciting to see that we could grow embryoid bodies in such a controlled manner."